The best part about the post-hype sleeper is that many owners who were let down by one of these players become gun-shy and often leave them off of their draft boards altogether. In turn, the player’s ADP stays reasonable, and an opportunity presents itself for those owners who are willing to separate the past from the present. Today, we’ll name our favorite post-hype sleepers at the wide receiver position. All of the following players are currently bargains at their ADP and they’re likely to remain that way through training camp and the preseason. After going all-in on Davis last offseason, I tried to temper my expectations following a rookie year that was derailed by a nagging hamstring injury and what seemed like zero red-zone targets. However, I bought right back in after the Titans hired Matt LaFleur as their offensive coordinator after watching him work under Sean McVay in Los Angeles with the Rams. The Rams didn’t have a receiver with Davis’ skill set last season, so you can expect LaFleur to use him in the slot (where he dominated in college), as the X in a role similar to Sammy Watkins, and in more of possession role like they used Robert Woods. Davis was PFF’s No. 6 overall player on their 2017 NFL Draft big board. You won’t find a skill position player just one year removed from being a top-10 NFL draft pick selected later than Ross. After an injury-plagued rookie season (following an injury-plagued college career), fantasy owners have seemed to jump fast off the bandwagon of the fastest player in NFL combine history (4.22-second 40-yard dash). The Bengals have taken strides to improve their offensive line (adding Cordy Glenn and Billy Price), which was the offense’s Achilles heel in 2017. They haven’t added much competition for Ross either. With more time to throw, Andy Dalton has always been a much better quarterback and Ross could be the main benefactor in 2018. And here we finish off our run through the 2017 first-round receivers. Although he is being selected earlier than Ross according to early ADP, Williams is falling late in drafts. Williams’ rookie season was derailed by a back injury, but that doesn’t take away the fact that he entered the NFL as a perfect fit for Chargers quarterback Philip Rivers’ skillset. Williams caught 51.9 percent of his deep targets — good for sixth in the nation — during his final college season. He drew a comparison from our analysts to Alshon Jeffery for how dominant he is on back-shoulder fades — another skillset that meshes perfectly with Rivers. Don’t be surprised if he emerges as the No. 2 target now that Hunter Henry is lost for the 2018 season with an ACL injury. The Lockett breakout season feels long overdue at this point and that’s the exact reason why he’s the perfect post-hype sleeper. Let the coach-speak with receivers like Brandon Marshall and Jaron Brown convince other managers as you target the only pass-catcher besides Doug Baldwin left on the roster who has built a rapport with Russell Wilson after Seattle let go of Jimmy Graham and Paul Richardson this offseason. Lockett has consistently performed well with limited targets and routes run, and once he sees a boost in both in 2018, he can finally emerge as a fantasy starter. Like Davis, Doctson also entered the NFL with a high evaluation from our college analysts after finishing with the most yards per route run (4.07) in his final college season at TCU. We’ve learned over time that yards per route run is one of the best indicators of future success, but that hasn’t come to fruition yet for Doctson, who has battled injuries. In 2018, Doctson will benefit from his first fully healthy offseason, a new quarterback with no past allegiances from a target standpoint, and the third-easiest fantasy schedule for wide receivers, according to our own Scott Barrett. It doesn’t cost much to grab Doctson in drafts as fantasy owners flock to bigger names like Jamison Crowder and Paul Richardson instead. Cobb is best described as a post-post-hype sleeper rather than a post-hype sleeper. Cobb has burned far too many owners to see his ADP rise even after the Packers decided not to replace Jordy Nelson with a big-name free agent or a high draft pick. Cobb has the best rapport with Aaron Rodgers on this roster as Davante Adams racked up a solid chunk of fantasy points during his breakout 2017 season with Brett Hundley. In 2018, Cobb could end up leading a Rodgers-led offense in total targets and you can get him at the price of a back-end WR3 right now while knowing his ADP won’t change much due to his recent history as a fantasy asset. Pryor was one of the most hyped players in August drafts after tearing up training camp with highlight-reel grab after highlight-reel grab, all while earning the praise of his then-quarterback Kirk Cousins. An ankle injury and a bad schematic fit derailed Pryor’s lone year in Washington. Now, he joins a Jets offense coordinated by Jeremy Bates who hails from the Shanahan tree in an offensive scheme that should fit Pryor’s skillset. As PFF’s Sam Monson wrote back during Pryor’s breakout stretch with the Browns, he runs a simple route tree and was very successful in doing so in Cleveland. The Jets will get back to using Pryor in ways where he wins. In the end, all Pryor has to beat out for targets is Robby Anderson and Quincy Enunwa. 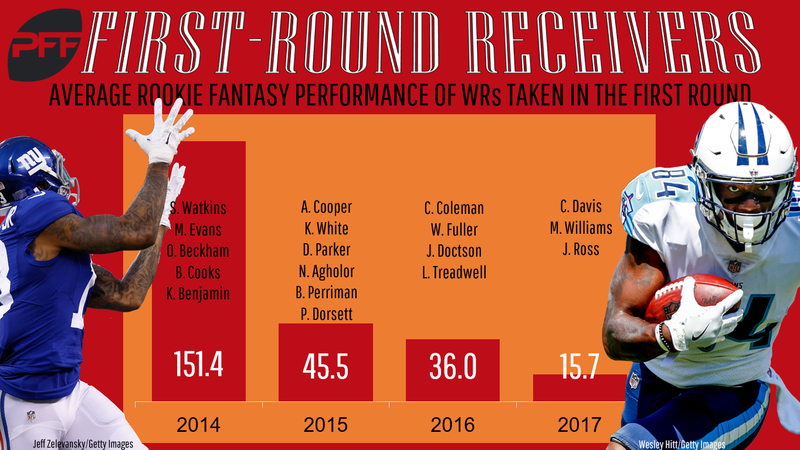 Watkins’ fantasy football cycle seemed to start and end the same way over the past several seasons with his hype reaching its height just before the start of the regular season. The changed last offseason when he was traded to the Rams. Now, Watkins will start all over with a new quarterback again, but he is also quietly coming off his first season in a while where he seemed to get over the nagging injuries that have plagued him in the past. Even in an offense that didn’t feature him, Watkins racked up healthy numbers in yards per route run and on deep targets with the Rams. If he emerges as the focal point in the passing game with a brand-new quarterback in the mix (Patrick Mahomes), his current ADP compared to Tyreek Hill’s will look foolish at the end of the season.